I, someday, will chase a few of these. Old books I read say they are the largest of the grouse family and only smaller than the pheasant, when it comes to game birds. Just recently, I read they are second only to the Sage Grouse in size in the Grouse family. Having harvested several Sage Grouse, I can agree with that. I've heard they eat as well as the Ruffed Grouse, too! High mountain habitat make the hunting very challenging and that is right up my alley. I'm still recovering from the last Chukar hunt I went on, but it only whetted my appetite for the red-legged demon. I'm going to study this bird and maybe figure out where I can get the dogs in the area of a suitable population. Lower elevation: Hunt edges, benches and draws. Look for berry or mast producing shrubs such as chokecherry, serviceberry, elderberry, currant (ribes), and oakbrush. Look for seaps and other water sources which tend to hold green forbs and insects later into the fall. Higher elevations: Get as high as you can and then hunt downwards. Know your trees! Lodgepole pine is too low, keep going to spruce/fir. Look for vaccinium with berries and high elevation forbs and/or pockets of insects. Look for sign such as feathers, droppings, tracks and dusting bowls. A good bird dog is an asset in the sage/aspen areas. They aren’t as much of an asset in the high country (where birds don’t tend to hold a point) and can even hamper your hunting efforts. For every bird you see, you’ve probably walked past 5-10. 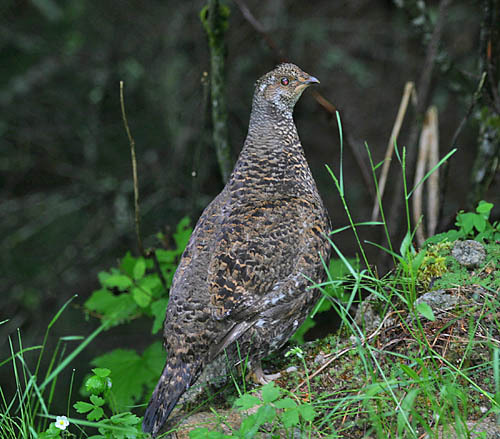 Dusky grouse (formally know as blue Grouse) tend to be gregarious; where you find 1 bird there should be others nearby. When flushed in the high country, blue grouse tend to fly downhill and often escape by flying up into trees. When in sagebrush-aspen areas they tend to hold for pointing dogs and flush.